The characteristics and range of Collins class submarines have been tailored specifically for its defence and two-ocean surveillance role in the Royal Australian Navy. Designed to be as quiet as advanced technology can achieve, Collins class submarines have been developed from five generations of submarines designed and built by the Swedish Navy. One of the first submarines to be totally designed by computers, these submarines boast a vast range of features. They include a high performance hull form, highly automated controls, low indiscretion rates, high shock resistance and an efficient weapons handling and discharge system. The submarine will move silently on electric power supplied by banks of new-technology batteries. The batteries are charged by three on-board diesel generator sets. The sophisticated combat system, which gathers its intelligence from its sensors, computes the input and then launches and directs weapons, is an advance on any system currently available. Each boat has been named after a distinguished former member of the RAN, some of whom have made the ultimate sacrifice for their country. Based at Fleet Base West in Western Australia, they are a formidable element in Australia's defence capability. Collins Class submarines HMAS Collins, HMAS Farncomb, HMAS Dechaineux and HMAS Sheean in formation while transiting through Cockburn Sound, Western Australia. 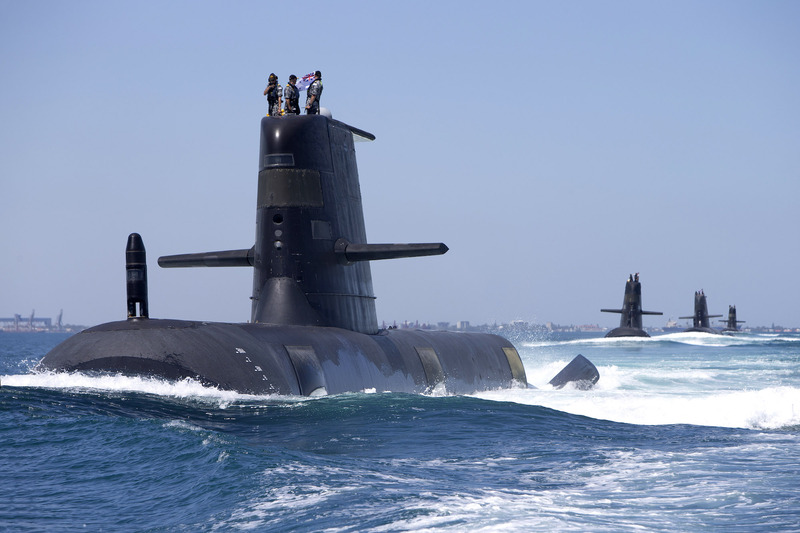 Collins Class submarines are an essential part of Australia’s naval capability, providing a strategic advantage in terms of surveillance and protection of our maritime approaches. Following is a list of Collins class submarines commissioned into the Royal Australian Navy.